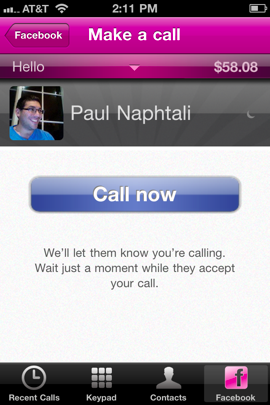 Want to make a long distance call on the cheap? You’ve got plenty of options, including the likes of Google Voice, Skype, and numerous other VoIP providers. But things can get a little tricky if you don’t know someone’s phone number, or they don’t already have Skype installed. Today VoIP service provider Jajah, which was acquired by Telefónica in 2009, has a solution that will appeal to Facebook users: a new feature for its Android application (iPhone’s coming soon) that lets you call your Facebook contacts. That sounds a bit confusing, but the feature is straightforward in practice. After installing the app on your phone, you’ll be asked to authenticate using Facebook Connect. You’ll then be able to see a list of all of your Facebook friends who are currently logged into Facebook Chat. Tap the one you wish to call, and they’ll receive an instant message with a link inviting them to join a free voice call with you. If they click it, a website will pop up and they’ll be able to talk using their computer’s speakers and microphone (they don’t need a Jajah account). The whole process, which you can see in the video below, takes about 10 seconds. And in case you’re worried about privacy, the service masks your outgoing phone number. The company originally launched this feature last fall in the UK with support for its Blackberry app, but for some reason it’s remained in private beta. The Android app is now live for everyone, and the iPhone app will be released pending Apple’s approval (the Blackberry app is still on the roadmap, though the release date sounds less soon). Jajah isn’t the only service that adds voice calling functionality to Facebook — last October Skype released Skype 5, which lets users call their Facebook friends’ phones (instead of sending them a link and initiating a call in the browser). Rumors continue to swirl that Facebook is working with Skype to bring deeper integration of video calling to the social network.